George BENJAMIN: Dream of the Song (2015). Bejun Mehta (c-ten), Lorelei Ensemble, Boston Symphony Orchestra, Andris Nelsons (cond.). Friday, February 10, 2017, 8:00pm, Symphony Hall, Boston. (http://www.bso.org/). Sofia GUBAIDULINA: Triple Concerto for violin, cello, bayan and orchestra (2017). Baiba Skride (vln), Harriet Krijgh (vlc), Elsbeth Moser (bayan), Boston Symphony Orchestra, Andris Nelsons (cond.). Friday, February 24, 2017, 1:30pm, Symphony Hall, Boston. (http://www.bso.org/). Matthias PINTSCHER: un despertar for cello and orchestra (2016). Alisa Weilerstein (vlc), Boston Symphony Orchestra, François-Xavier Roth (cond.). Saturday, March 25, 2017, 8:00pm, Symphony Hall, Boston. (http://www.bso.org/). Written expressly for countertenor Bejun Mehta, George Benjamin’s Dream of the Song consists of six movements. The English and Spanish poems concern familiar subjects: mortality and time’s passing. It takes but a moment to acclimatize to Mehta’s eerie but nimble timbre as the soloist and women’s voices interweave with different texts. The settings are bright and intricate despite the modest instrumentation of solo countertenor, small female choir, two oboes, four horns, percussion, two harps and strings. The horn quartet often steps forward assertively, and Benjamin often cleverly carries a pitch or chord across winds, strings and voices. The most seductive effects are when the countertenor melts into the women’s octet enabled by winds. I found the 20-minute Dream of the Song entrancing, whereas I have been unable to get into Benjamin’s recent opera, Written on Skin (2012), which also featured Mehta in its performances and recording. The accompanying ensemble’s luminescence despite limited forces does beguile. Mehta, Benjamin and the Royal Concertgebouw Orchestra recorded this for RCO 16003. (The recording includes Magnus Lindberg’s impressive Era, Richard Rijnvos’ inventive fuoco e fumo, about the fire that destroyed La Fenice in 1996, and Tan Dun’s unfortunately predictable double bass concerto, The Wolf.) In contrast, the Boston-based Lorelei ensemble was decidedly more elegant and blended. It would have been good to have heard this twice in a row. Gubaidulina’s one-movement Triple Concerto is a consummate mystery. It does not present itself as a typical concerto requiring flamboyant soloists and an obliging orchestra. The soloists might inflict clusters (bayan) or striving melodies (cello) which the orchestra cradles awkwardly. The slowly unfolding work revisits an easily recognizable collection of pitches which are treated as a gigantic ladder across which the soloists climb and descend. The orchestra offers bold outbursts, especially at the end where the brass dominate powerfully, reassembling pitches we’ve heard throughout. In her program note, Gubaidulina emphasizes the work’s “three-ness” in its title, in the use of triads, three-note gestures, and in the different types of materials and how they react with each other. There are probably other religious parables. What impresses from the outset is how sparingly but powerfully the orchestra is applied. Deep sonorities support the trio’s first entrance, stentorian descending minor ninths and low brass growling recalling Wagner’s dwarves and dragons. When the violin section appears, the sonority surprises. Similarly flute and piccolo startle. I don’t often think of Gubaidulina as a spectralist, but there were purposeful motives that walked the natural overtone series in the horns as well as the consistent chords. Skride and Krijgh were often duo partners, sometimes interacting or striving in unison. Moser was frequently a catalyst, releasing clusters that would nudge strong subterranean orchestral responses. Moser has had a long history with Gubaidulina. Un despertar, Matthias Pintscher’s cello concerto, gets its title from an Octavio Paz poem, and seeks to inhabit the text’s mood of insomnia and uncomfortable exhaustion. The cellist emerges from silence, “an awakening,” as the title indicates. Long lines are alternated with trills and churning gestures that recalled the Lutosławski concerto. Pintscher was inspired by Weilerstein’s style and has written many brooding, passionate low passages for her. The orchestra, alternately thin and thick, presents a fast-paced support of chords and glimmering activity. There is much percussion, the onstage pianist spent time working the strings directly, but overall the orchestra was rarely used en masse, instead contributing subtle, languid notions to complement the cellist’s wiry wanderings. Contrasting Pintscher’s showier music of decades past, the composer now prefers doing more with less. However, it was evident that sensitive effects, such as a few orchestral cellists bowing on their tailpieces, weren’t optimally balanced. The Benjamin concert I attended (which included Berlioz’s Symphonie Fantastique) reminded me why I often prefer recordings. We were seated directly in front of the most fidgety and distracting concert goers, a couple perhaps in their seventies. Barking into a cellphone, the husband proudly declared that they had never attended the “[expletive]” symphony before. During the Benjamin they shared vulgar comments about the countertenor and were constantly letting their programs fall to the floor. At the start of the Berlioz, the wife’s bracelets announced she was continuously checking her watch. Between pieces, they wondered out loud why we moved away from them. The Gubaidulina concerto was followed by Shostakovich’s circuitous Seventh. Pintscher’s concerto was inserted between Berlioz’s Le Corsair overture and an unenthusiastic Beethoven Sixth. Unlike other performances, the Second Violins were separated from the Firsts and the Cellos and Basses placed at the right side. I don’t know if this was specified by Pintscher or was François-Xavier Roth’s preference. Henri DUTILLEUX: Symphony No. 2, “Le Double” (1955-59). Boston Symphony Orchestra, Alain Altinoglu (cond.). Thursday, March 30, 2017, 8:00pm, Symphony Hall, Boston. (http://www.bso.org/). Dutilleux’s Second is one of my favorite symphonies of all time. It might not be the most modern or dissonant, but every note is just right, and the jazz touches (especially from the harpsichord) which can seem a tiny bit corny never hesitate to delight. There are also unending passages of magical chords and sudden shifts in orchestration, so that close listening becomes an advanced class in instrumentation. I wish Le Double were longer, but Dutilleux was a perfectionist and we should be grateful for what we have. The title is ambiguous, although the symphony is for two orchestras, a 12-person chamber orchestra (clarinet, oboe, bassoon, trumpet, trombone, celeste, harpsichord, four timpani [one player], two violins, viola and cello) and standard orchestra. 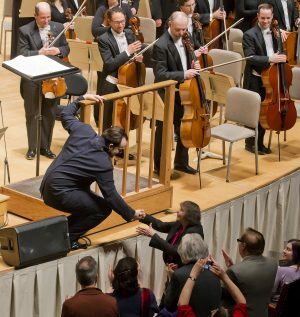 The BSO commissioned the work for its 75th anniversary. Charles Munch premiered it back in December 1959. Later orchestral works lack the same frisson, and it may be simplistic to say Métaboles (1964) and Timbres, espace, mouvement (1978) smudge together. Dutilleux ought to appeal more widely. His fastidious details are unusual for a non-atonal composer, and I suspect they prove daunting without extensive preparation. The BSO did just fine; Altinoglu was alert and enthusiastic. The Dutilleux followed the intermission in a program that included Berlioz’s Roman Carnival overture, Lalo’s Symphonie espagnole with Renaud Capuçon, and concluded with Roussel’s Bacchus et Ariane, Suite No. 2. It seemed to take the orchestra a bit of time to warm up, as they were most energetic in the less frequently heard Roussel. John HARBISON: Symphony No. 1 (1981)1; Symphony No. 2 (1987)2. 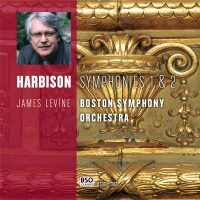 Boston Symphony Orchestra, James Levine1,2 (cond.). BSOCL 1302 (MP3, AIFF, FLAC or FLAC5 download) (http://www.bso.org/). John HARBISON: Symphony No. 3 (1990)3; Symphony No. 4 (2004)4. 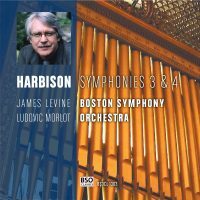 Boston Symphony Orchestra, James Levine3, Ludovic Morlot4 (conds.). BSOCL 1303 (MP3, AIFF, FLAC or FLAC5 download) (http://www.bso.org/). John HARBISON: Symphony No. 5 (2008)5; Symphony No. 6 (2011)6. Sasha Cooke5 (m-sop), Gerald Finley5 (bar), Paula Murrihy6 (m-sop), Boston Symphony Orchestra, Jiří Bělohlávek5, David Zinman6 (conds.). BSOCL 1304 (MP3, AIFF, FLAC or FLAC5 download) (http://www.bso.org/). 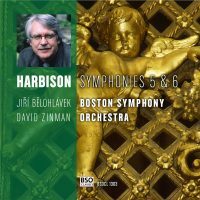 John Harbison’s six symphonies are neither glamorous nor cuddly. They are no-nonsense statements, efficiently constructed, rarely offering connecting membranes or transitional passages between different ideas. Different material or gesture types are often isolated to specific instrumental groups, including pitched and non-pitched percussion combinations. Except for the Fifth, each symphony passes in less than 30 minutes, compact efforts suggesting late Haydn. Such lean presentation may suggest aloofness, as ideas are rarely repeated identically. One must pay attention to make sense of them. There are numerous moments that recall Bartók and Stravinsky, especially in the wind writing: the start of the fifth movement, Esuberante, of No. 3 and the Scherzo of No. 4. As a series spanning 30 years, Harbison’s style is consistent, solidly locked into a modernist language infused with jazzy gestures. Such cues appear often, almost as if out of nowhere, most notably in finales: the percussion ending the First, the exuberant big-band conclusion of the Third, and the coda of the Fourth. Bold syncopations are also a well-used ingredient in No. 1 and the propulsive opening of No. 4. Harbison could be Bernstein’s older, more reliable (and more educated) brother. As an audience member I’ve noticed that listeners for a piece with words fall into three groups: 1) those who follow the text as the music is being performed, 2) those who read the text over, before or after the performance, with varying degrees of attention, and 3) those who pay no close attention to the text at any point, but listen only “symphonically,” that is, to the pattern of sound. Those in the last group, though the ones for whom I have the least understanding, are probably the ones best qualified to decide whether this piece is, indeed, a Symphony. Every piece with singers and instruments should be coherent as a lucid sequence of sounds. These sounds, without reference to their verbal origins, aspired to a significant musical shape, something symphonic. One take-away is that Harbison advises us to do our homework before approaching his music, definitely if there be texts. The Fifth concerns Orpheus and Eurydice and includes an obbligato electric guitar, ostensibly to represent the lyre. Texts are by Czesław Miłosz, Louise Glück and Rainer Maria Rilke. The Rilke setting uses both voices in artful canonic imitation. The first movement of No. 6 sets Entering the Temple in Nimes by James Wright. Harbison’s six take time to appreciate. Befitting their scale or nature, Harbison stops short of the truly demonic or grandiose. I recall hearing the First live a long time ago, but now would recommend starting with the Third plus Fourth release. No. 3, which opens with a wonderful shrugging gesture that wouldn’t be out of place in Sciarrino, is perhaps my favorite of the half-dozen. Vocally inclined folks should begin with the Fifth and Sixth.